The worked examples in this chapter use the guidance given in Eurocode 7 Part 2 on the scope of ground investigations to illustrate where there are significant changes from current UK practice. 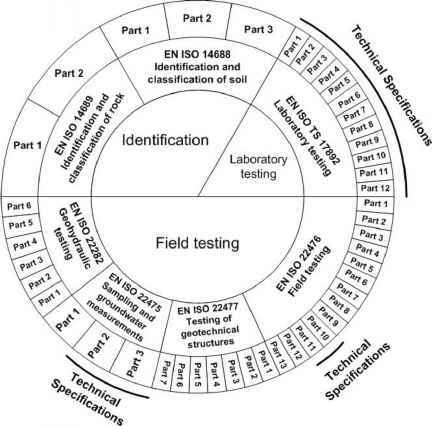 Example 4.1 considers the specification of field work for a hotel site in North West England; Example 4.2 looks at how changes in soil description will affect the borehole logs; and Example 4.3 discusses the specification of laboratory tests. Specific parts of the calculations are marked O, ©, ©, etc., where the numbers refer to the notes that accompany each example. 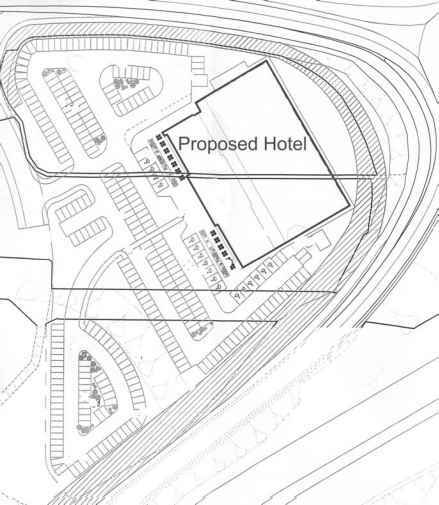 Example 4.1 considers a site in the North West of England where a new hotel complex is proposed (see Figure 4.16), comprising a five storey hotel building and associated car parking plus amenity areas. The section of the site to be occupied by the hotel building will be approximately 80m x 60m. The general geology of the area indicates drift deposits comprising glacial till or sand and gravel overlying Westphalian coal measures. The drift deposits may be up to 15m deep and vary laterally. O Recommended spacing of investigation points for high rise and industrial structures is given in Annex B of EN 1997-2. © The function 'ceil' rounds up to the nearest integer, hence ceil (80/40 + 1) = 3 and ceil (60/40 + 1) = 3. And 3 x 3 = 9. © The function 'floor' rounds down to the nearest integer, hence floor (80/15 + 1) = 6 and floor (60/15 + 1) = 5. And 6 x 5 = 30. © How many investigation points to provide between 9 and 30 is a matter of engineering judgement. Since the hotel building is relatively low rise, we have chosen a value (12) towards the lower end of this range. Eurocode 7 does not require that all these points be boreholes, but sufficient investigation to depth is required to determine any vertical or horizontal variation in ground properties. © The minimum depth of investigation for individual footings is 6m. © Unless a competent stratum is encountered at shallower depth, the minimum depth of investigation for a raft is 90m! It is likely at this site that coal measures will be encountered within 15m of ground surface. Thus, the investigation may be terminated 2-5m into the competent stratum (i.e. 17-20m depth). At least one of the early investigation points should be taken deeper into the underlying stratum to check for weaker layers. The rest of the investigation may then be adjusted to account for the information gathered. © The minimum depth of investigation for a piled foundation is 60m. Similar reasoning to © above may allow that depth to be shortened. © The scope of investigation recommended by EN 1977-2 is much greater than that which has traditionally been carried out in the UK. For this project, eight boreholes were drilled to a maximum depth of 13.2m supplemented by 20 trial pits. Only three boreholes and seven trial pits were within the hotel's footprint; none of the boreholes penetrated the underlying coal measures, but some terminated in a dense to very dense sand or gravel. Consider the design of a ground investigation for a new hotel complex, comprising a five storey hotel building and associated car park and amenity facilities. The building will occupy an area B = 80m x L = 60m of the site. How to decide number of boreholes euro code 7?